I am slightly obsessed with my compost. A few moments ago, I trekked out in the steamy heat to the Darth Vader-looking compost bin beside my house, and I dumped in a fresh bucket of rotting food. Sometimes the discarded food looks almost pretty. Some days I have bright green watermelon rinds, purple-stained onion peel, or bits of green and red strawberry hulls. Today, though, the food I dumped wasn’t really that pretty at all. There were brown egg shells, white cauliflower stems, some slimy peach pits, and a few yellow, wilting parsley leaves. As I stood over the bin and emptied my bucket, a sour smell arose from the bin’s acrid depths, and gnats and flies, disturbed from feeding on the rotting carnage, buzzed in annoyance around my head. I suppose I can’t say that my experience of dumping compost was particularly pleasant, but it was immensely satisfying, and it was also comforting, for reasons I didn’t fully understand until a few weeks ago when I spent a little time meditating on my compost obsession. Compost, as I am sure you know, is rotting food. It’s the stuff that is discarded, ugly, smelly, moldy, decomposing. Most of us stuff our compostable food down the garbage disposal or scrape it off of our plates and into the trash. Some of us, though, are slightly obsessed with our compostable food, perhaps because we feel some affinity to it. 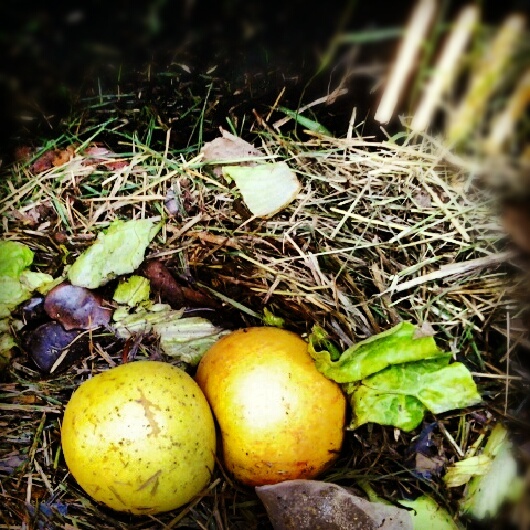 Compost is, to me, a bit of a miracle. The bacteria present in the rotting flesh of a bruised strawberry can nourish next year’s strawberry patch. The vitamins in those discarded green edamame pods will break down into rich, black dirt that will make next year’s tomatoes that much sweeter. I know this, which is why, every couple of days year-round, I lug out wilted spring greens, bright watermelon rinds, orange pumpkin shells, and the leafy tops of winter root vegetables. And then, in the spring, I watch as Matt tills the compost into our garden. It’s amazing, really. Our trash becomes a treasure. This year, with the rotten food we have tilled beneath the ground’s warm surface, we our nourishing watermelon, cantaloupe, sugar snap peas, peppers, tomatoes, basil and various other herbs, lettuce, beets, beans, corn, sweet potatoes, eggplant, and onion. This is life. Extracted from death. I feel such affinity with my compost because my soul is just like that compost. It is life. Extracted from death. The compost bin of my soul is even more unsightly than the Darth Vader version we have in our back yard. It’s ghoulish, really. Monstrous. There is so much that is rotten that I have tossed into my soul’s compost bin. Honestly, I don’t want to tell you what is there. If I tell you, you might not want to visit my garden. You might assume that the garden of my soul is as wretched and putrid as that very same soul’s compost bin. But if I don’t tell you, then you won’t truly understand the miracle that is compost. You won’t understand how something so rotten can become so beautiful. Let’s open the lid and poke around a little. Almost daily I toss in some insecurity and impatience and snarkiness. Sometimes I dump in a lie or a handful of pride or a sprinkling of gossip. There’s some big stuff in there, too, that is going to take awhile to break down. There’s the mold of perfectionism I press myself into. Many days I wonder if it will ever really break down into rich soil. There is also a large pile of ugly things I have said and ugly things that have been said to me. Then there are some things too painful to talk about here, really. If you dig deep enough you will find more grief and shame than I really care to sift through. But here’s the thing: I can take that putrid mess, and I can dump it in my trash, where it will then go compost in a landfill, but it will not nourish anything but the trash around it. Or, I can take that compost in all of its rottenness and ugliness and stench, and I can work it back into the soil of my soul, where it can nourish my soul and become something beautiful. I choose to believe that God, as the gardener of my soul, will help me till the soil and tenderly nourish the fruit that is all the sweeter for the garbage that has mixed with the sun and the rain. Today, I invite you to visit my garden. Feel free to poke around in my compost, but also please enjoy the ripe offering I hand you, the sweet fruit nourished not only by the sun and the rain, but also by the tears, the sadness, and the shame. And when you go home, take care of your own rotting compost. Work it into your soul and into the souls of the community surrounding you, and know that you and God can turn all that is bruised, rotting, and ugly into something truly beautiful. Tags: compost, gardening, God, soul. Bookmark the permalink.